Once again, the Daily Parker will participate in the Blogging A-to-Z challenge, this year on the theme: "Basic Music Theory." For the A-to-Z challenge, I'll post 26 entries on this topic, usually by 7am Chicago time (noon UTC) on every day except Sunday. I'll also continue my normal posting routine, though given the time and effort required to write A-to-Z posts, I many not write as much about other things. This should be fun for you and for me. Music theory explains how and why music works. Knowing about it can help you listen to music better. And, of course, it'll help you write music better. The first post will be on April 1st. On 13 May 1998, just past midnight New York time, I posted my first joke on my brand-new braverman.org website from my apartment in Brooklyn. My first website of any kind was a page of links I maintained for myself starting in April 1997. Throughout 1997 and into 1998 I gradually experimented with Active Server Pages, the new hotness, and built out some rudimentary weather features. That site launched on 19 August 1997. On May 13th, 20 years ago today, I added a Jokes section. That's when I started posting things for the general public, not just for myself, which made the site a proto-blog. That's the milestone this post is commemorating. Shortly after that, I changed the name to "The Write Site," which lasted until early 2000. In 1999, Katie Toner redesigned the site. The earliest Wayback Machine image shows how it looked after that. Except for the screenshot above, I have no records of how the site looked prior to Katie's redesign, and no easy way of recreating it from old source code. I didn't call it a "blog" until November 2005. But on the original braverman.org site, I posted jokes, thoughts, news, my aviation log, and other bits of debris somewhat regularly. What else was it, really? Today, The Daily Parker has 6,209 posts in dozens of categories. Will it go 20 more years? It might. Stick around. Once again, thanks for reading. And keep your eyes peeled for another significant Daily Parker milestone in a little less than two weeks. For day 2 of the Blogging A-to-Z challenge, I'm going to talk about the first computer language I learned, which is still alive and kicking in the .NET universe decades after it first appeared on a MS-DOS 1.0 system disk: BASIC. BASIC stands for "Beginner's All-Purpose Symbolic Instruction Code." The original specification came from John Kemeny and Thomas Kurtz at Dartmouth College in 1964. Today it's one of the core .NET languages included with Visual Studio as "VB.NET" (for "Visual BASIC," Microsoft's dialect of BASIC released in 1991). What's different? Well, a lot of things: no braces, no include lines, no semicolon line endings...and that's just for a 2-line program. But look at what's the same. Because this is a .NET program, the actual guts of it look almost exactly the same. There are two calls to different methods on the Console object, and except for the missing semicolons, they are identical to the calls in C#. Wow. The IL is exactly the same. So both the VB.NET and C# code compile down to functionally identical assemblies. And that's one of the most important characteristics of .NET: it lets you write code in any language you want (as long as someone has written a compiler for it), and run it on any platform you want (as long as there's a CLR for it). I worked with Visual BASIC from versions 1 to 6, and then did one project in VB.NET before switching to C# in 2002. You really would need to pay me a lot of money to go back to it. I believe C# is more expressive, more concise, and more able to reflect my intentions than VB.NET. But there is nothing wrong with VB.NET. If you want to use BASIC, enjoy. With the .NET ecosystem, it's up to you. The A-to-Z Challenge starts tomorrow, and I'm all set to go with a list of 26 topics on programming with Microsoft .NET. Now I just need to write the actual posts. It's interesting to me how vacations don't actually lend themselves to much productivity, even when that's the explicit purpose of the vacation. Anyway, if I do my job today, the first post will hit at noon UTC tomorrow. If I don't do my job today, it'll hit sometime later than that. Politically-motivated Spam from an island nation's PR department? Over the past few weeks I've gotten several emails from someone purporting to be "Jess Miller" in New Zealand, mentioning she'd noticed a post I did on the Maldives in 2012. That post reported on the violent coup d'état that overthrew the democratically elected government of the island nation just southwest of the Indian subcontinent. And just a few weeks ago, the military dissolved Parliament and threw the country into more unrest. The U.S. State Department has issued a level-2 caution. Understandably, tourism has declined somewhat, which is a pity because it's unlikely the country will exist after another 50 years of climate-change-induced sea-level rise. Anyway, "Jess" sent me an email about my "wonderful blog post" and called out "a solid blog post [she'd] read in the past," which turned out to be the U.K. Foreign Office travel warning about the place. Then there's the punchline: "Jess" wants to cross-post with her "best things to do in the Maldives" article on her own site. I think the best thing to do in the Maldives right now is not to go there. So, "Jess," your article is very attractive and I think a wonderful list of things to do once the government of the Maldives returns to civilian control, their economy stops its free-fall, tourists stop getting robbed in their hotel rooms, and climate change goes into reverse so they stop suffering the existential peril that is driving all these problems. Any takers on a bet that "Jess" has funding from a Maldives tourist agency? I've got 26 topics lined up for each. I think they'll all be fun and relatively easy to do (though I'll have to start writing them at least a week ahead). But like a true INTP, I can't decide which to start with. Sign-up is at 00:01 GMT tonight, or 6:01 pm Chicago time. 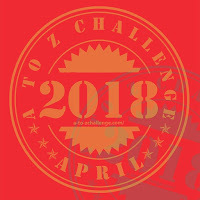 This year, The Daily Parker will participate in the Blogging A-to-Z challenge. No, the challenge will be coming up with 26 entries on one specific topic, and making them worth reading. Keep reading to see (a) what topic I pick and (b) how I do. * braverman.org had a proto-blog starting in May 1998. Let that sink in. We didn't even call it "blogging" back then.